VANCOUVER, CANADA – Kaizen Discovery Inc. (TSXV: KZD) today announced significant copper-gold mineralization has been intersected in 12 of 13 diamond drill holes from the remainder of its 2015 drilling program on the Ketchan copper-gold porphyry prospect at its Aspen Grove Project in southern BC. 72 metres grading 0.31% copper and 0.20 g/t gold (0.46% copper equivalent) in drill hole K15-03. All 13 drill holes intersected potassic and/or calc-potassic alteration within the host Ketchan Lake intrusive stock. Kaizen tested and confirmed the size of the porphyry body and continuity of mineralization across 1,800 metres of strike length. Due to widely spaced drilling (150 to 250 metres between collars) and shallow historic drilling, the system remains open in most directions. Total diamond drilling meterage for the 2015 program at Aspen Grove was 6,483 metres in 14 holes, including one hole at the Par prospect and 13 at the Ketchan prospect. Results from the Par (AG15-01) and first two Ketchan holes (K15-01 and 02b) previously were reported and included a 78-metre interval grading 0.50% copper and 0.15 g/t gold (0.61% copper equivalent) in hole K15-01 (see Kaizen's news release on July 20, 2015). The Aspen Grove Project covers 11,237 hectares in southern British Columbia's premier copper porphyry belt, part way between the Copper Mountain and Highland Valley mines (see Figure 1 below). Kaizen owns 60% of Aspen Grove, with Kaizen's strategic partner, ITOCHU Corporation of Japan, owning a 40% interest. Exploration at the Aspen Grove Project is being funded by C$4 million in dedicated financing for the project provided by ITOCHU, with Kaizen as the operator. Exploration at the Ketchan prospect is targeting a 300-to-500 by 1,800-metre long, north-northwest trending, copper-gold mineralized porphyry system, as defined by airborne magnetics, geological mapping, rock sampling and induced polarization surveys. The mineralized system is hosted in the Ketchan Lake intrusive stock, and is characterized geophysically by a central zone of high chargeability flanked by parallel magnetic highs. The 2015 drill program tested these geophysical targets with inclined holes spaced at 150 to 250 metres, over a strike length of 1,800 metres. "We are very encouraged that drilling has yielded significant copper-gold mineralization over lengthy intervals throughout the Ketchan porphyry system, and in particular the presence of high copper and gold grades at shallow depths," said B. Matthew Hornor, President and CEO. "We plan to follow up next field season with a focused drilling program aimed at expanding these high-grade zones, utilizing funding already in place." Holes K15-10 (10a, 10b), 11, and 12 were drilled in the northwest portion of the porphyry system. Copper-gold mineralization is associated with a strong magnetic anomaly and weak chargeability. Chalcopyrite-bornite mineralization is hosted in diorite porphyry to microbreccia, in disseminations and hosted in epidote-calcite veins. Minor chalcopyrite and pyrite is hosted in magnetite/hematite-K feldspar (potassic) veins. Gold grades are higher in this part of the porphyry system. Holes K15-03, 04, 05, and 13 were drilled in the central area of the Ketchan porphyry system, near previously reported K15-01 and 02b. The best grades of copper and gold are generally associated with the margins of magnetic highs with associated moderate chargeability. Chalcopyrite and pyrite mineralization (disseminated, clots, and stringers) is associated with a variety of diorite and diorite breccia phases, in disseminations and in magnetite/hematite-K feldspar (potassic) and epidote-calcite-magnetite (calc-potassic) veins. Late gypsum veins were intersected deeper in the porphyry system. 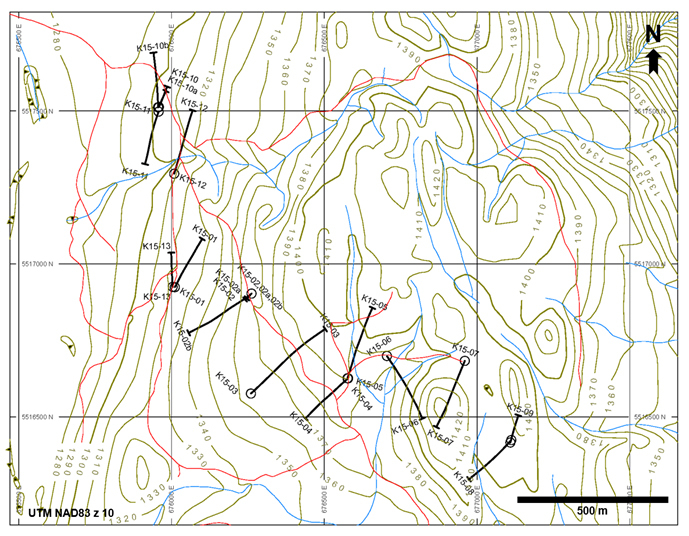 The southeast portion of the porphyry system was targeted by holes K15-06, 07, 08, and 09. Chalcopyrite mineralization occurs in disseminations and veins, associated with magnetite-pyrite-actinolite-K feldspar veins and later calcite-epidote veins. 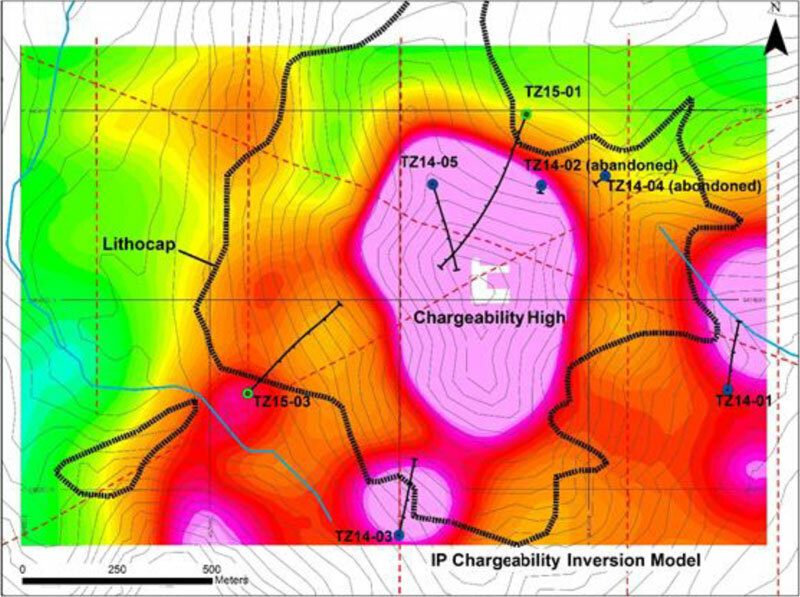 As in the central area, the best grades of copper and gold are generally associated with the margins of magnetic highs with associated moderate chargeability. Hole K15-07, while having no significant intercepts of gold or copper, intersected potassic alteration confirming the large size of the hydrothermal system and continuity of favourable dioritic host rocks. 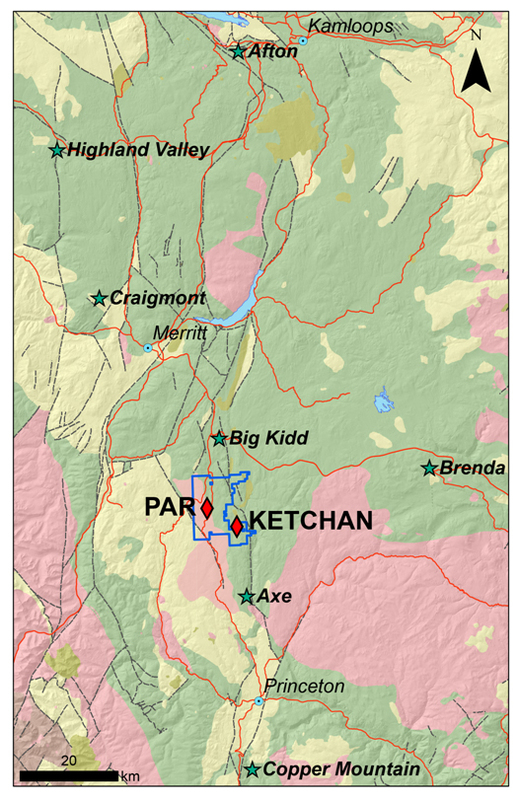 Figure 1: Location of the Ketchan and Par prospects at Kaizen's Aspen Grove Project. 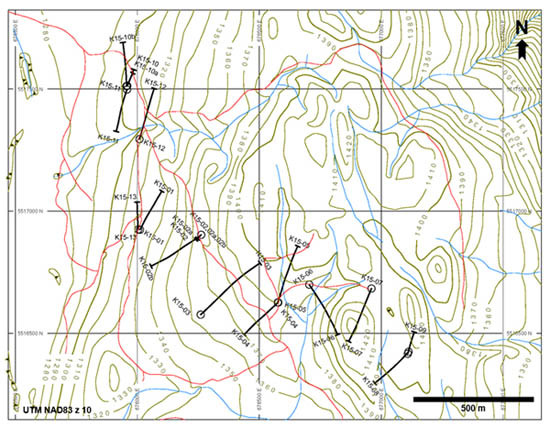 Figure 2: 2015 drill collars on the Ketchan prospect, Aspen Grove Project. Note: Elevation contours in metres above sea level. Table 1: Assay results for drill holes at Ketchan prospect, July-September 2015. Kaizen also completed an induced polarization survey over a southern extension to the Ketchan area, known as Ketchan South. The survey consisted of 21.4 line kilometres of survey, covering approximately six square kilometres. A 250-metre wide by 2.4-kilometre long chargeability high strikes north-south along the eastern margin of the survey. Table 2: Azimuth and dip of Kaizen's 2015 drill holes at the Ketchan prospect. Holes K15-10, -10a, and -10b were drilled from the same location in similar orientations; K15-10 and -10a both were abandoned in faulted ground, after encountering strong copper mineralization; K15-10b was completed to target depth. The Tanzilla Project is located in northwest British Columbia, approximately 20 kilometres southeast of the community of Dease Lake. The project is 10 kilometres east of Provincial Highway 37 and 65 kilometres north of the recently commissioned Red Chris copper-gold mine. The property covers a seven-kilometre long hydrothermal alteration zone in Lower Jurassic Hazelton Group volcanic rocks, interpreted as related to one or more buried porphyry centers. The alteration zone encompasses a one by three kilometre chargeability high that is open to the east, and is cored by a prominent advanced argillic to phyllic lithocap (Silica Ridge), first drill tested in 2014 (see Kaizen's news release on September 24, 2014). The lithocap is typical of the style of alteration commonly seen in the upper levels of calc-alkalic porphyry systems. Kaizen's 2015 drill program was designed to test to greater depth below and along strike from the 1.5 kilometre-wide Silica Ridge lithocap and associated chargeability anomaly. Three drill holes totalling 1,877 metres were completed, and confirm the conceptual model of a buried porphyry system and associated alteration footprint. Figure 3: Tanzilla Project 2015 drill collars, showing chargeability anomaly (coloured), IP lines (dashed red), and perimeter of lithocap (black). The most significant results are from hole TZ15-01, which was collared on the north side of Silica Ridge, 300 metres northeast of TZ14-05, which was terminated in the lithocap at 475.5 metres. Hole TZ15-01 intersected lithocap-style advanced argillic to phyllic alteration similar to TZ14-05 from surface to 288 metres. Below the lithocap, a multiphase suite of high level diorite porphyries and hydrothermal breccias was intersected to the end of the hole at 840 metres. Alteration in the porphyries and breccias ranges from upper chlorite/sericite-pyrite to lower albite, K-feldspar, magnetite and biotite (sodic and potassic alteration). Quartz, sulfide, chlorite and anhydrite/gypsum veining is widespread in the porphyry, forming dense stockworks from 403 to 423 metres. The best mineralization was intersected in the lithocap between 74 and 240 metres, which averaged 721 parts per million (ppm) copper and 41 ppm molybdenum over 166 metres. Mineralization in this section is high sulfidation type (chalcocite, covellite, chalcopyrite, bornite and molybdenite), associated with intense brecciation and phyllic (muscovite), intermediate (illite) and advanced argillic (pyrophyllite-kaolinite-topaz) alteration. Higher grade intervals include: 1,109 ppm copper over 12 metres (136 to 148 metres), and 1,273 ppm copper over 22 metres (180 to 202 metres). Single two-metre samples assay up to 0.34% copper and 0.12% molybdenum. In the porphyry, copper and molybdenum values are anomalous over lengthy intervals (e.g. 307 ppm copper and 22 ppm molybdenum over 264 metres, 376 to 640 metres), with single two-metre samples assaying up to 0.17% copper and 0.21 grams per tonne gold. Drill hole TZ15-02 was collared 2.6 kilometres southeast of TZ15-01 to test a peripheral zone of structurally controlled advanced argillic alteration (Gopher Zone). This hole intersected strongly sheared bladed feldspar porphyry with an upper zone of advanced argillic alteration overlying sericite-chlorite-anhydrite alteration to the end of the hole at 438 metres. Copper values are anomalous throughout, with the highest values in the upper part of the hole where chalcocite and covellite is associated with advanced argillic alteration (e.g. 359 ppm copper over 92 metres, 28 to 120 metres). Drill hole TZ15-03 was collared in an overburden covered valley southwest of Silica Ridge, one kilometre southwest of TZ15-01. This hole penetrated 541 metres of weakly altered (argillic, propylitic) andesite and diorite porphyry before intersecting intensely advanced argillic altered hydrothermal breccias at depth (541 to 600 metres, end of hole). Copper is only weakly anomalous. The intersection of a high-level advanced argillic alteration zone at depth suggests a structural complexity that requires further constraint. The results of the widely spaced drilling at Tanzilla to date confirm the conceptual model of a buried calc-alkaline porphyry system with a large footprint. Additional exploration is warranted to vector toward the potentially higher grade core of the system, with the possibility that post-mineralization structures may well have modified the original geometry and zoning of the system. The Tanzilla Project is comprised of 26 claims (8,032 hectares) that are 100% owned by Kaizen. The program is being funded by Freeport-McMoRan of Canada Limited (Freeport), a wholly-owned, indirect subsidiary of Freeport-McMoRan Inc., as part of an earn-in agreement. Freeport can earn an initial 51% interest by funding cumulative expenditures of C$8.0 million over a four year period. Kaizen is the operator under the agreement. Kaizen also announced that the TSX Venture Exchange has accepted for filing the company's new Restricted Share Unit Plan as approved by shareholders on a disinterested basis at the company's annual and special shareholders meeting held on June 30, 2015. Pursuant to the terms of the Plan, up to 1,600,000 common shares of Kaizen would be issuable to eligible participants in the form of restricted share units. Vesting may be subject to performance criteria as determined by Kaizen. Kaizen's disclosure of a technical or scientific nature in this news release for the Aspen Grove Project has been reviewed and approved by Nils Peterson, M.Sc., P.Geo, a geological consultant for Kaizen, who serves as a Qualified Person as defined under National Instrument 43-101. Mr. Peterson is not independent of Kaizen for purposes of NI 43-101. Drill-core samples (2-metre sample length) for the Aspen Grove Project were prepared at Kaizen's core logging facility in Merritt, BC, and samples were shipped to ALS Minerals' preparation lab in Kamloops, BC. Ketchan samples were analyzed at ALS's ISO 17025:2005-certified North Vancouver laboratory for gold, platinum and palladium by fire assay and ICP-AES, and for 35 elements, including copper, molybdenum and silver, by ICP-AES using an aqua regia digestion. Ore grade analyses also were completed by ICP-AES with aqua regia digestion. Core intervals cited above represent apparent, not true widths; true widths are not known. Assay intervals above have been calculated with no cutoff value. Blanks, standards and duplicate samples were inserted into the sample sequence with a ratio of approximately one sample out of 15. The 2015 Aspen Grove drilling program and sampling protocol was supervised by Nils Peterson, M.Sc, P.Geo, a geological consultant for Kaizen, and by John Bradford, M.Sc., P.Geo. Mr. Peterson has verified the Aspen Grove data disclosed in this news release. Kaizen's disclosure of a technical or scientific nature in this news release for the Tanzilla Project has been reviewed and approved by John Bradford, M.Sc., P.Geo, a geological consultant for Kaizen, who serves as a Qualified Person as defined under National Instrument 43-101. Mr. Bradford is not independent of Kaizen for purposes of NI 43-101. Drill-core samples for the Tanzilla Project were prepared at Kaizen's core logging facility in Dease Lake, BC, and samples were shipped to ALS Minerals' preparation lab in Terrace, BC. Samples were analyzed at ALS's ISO 17025:2005-certified North Vancouver laboratory for gold by fire assay and ICP-AES, and for 35 elements, including copper, molybdenum and silver, by ICP-AES using an aqua regia digestion. Assay intervals above have been calculated with no cutoff value. Blanks, standards and duplicate samples were inserted into the sample sequence with a ratio of approximately one sample out of 25. The 2015 Tanzilla drilling program and sampling protocol was supervised by Tony Barresi, B.Sc., Ph.D., a geological consultant for Kaizen. Mr. Bradford has verified the Tanzilla data disclosed in this news release. Forward-looking statements include, without limitation, statements regarding a focused drilling program next field season at Aspen Grove and a potentially higher grade core of the Tanzilla system warranting additional exploration. Forward-looking statements involve significant risks and uncertainties, should not be read as guarantees of future performance or results, and will not necessarily be accurate indicators of whether or not such results will be achieved. Although Kaizen has attempted to identify important factors that could cause actual results, performance or achievements to differ materially from those contained in the forward-looking statements, there can be other factors that cause results, performance or achievements not to be as anticipated, estimated or intended, including, but not limited to, equipment failure, unexpected changes in laws, rules or regulations, the failure of parties to contracts to perform as agreed, the failure of exploration programs or studies to deliver anticipated results or results that would justify and support continued exploration, studies, development or future operations, and local opposition to exploration activities. There can be no assurance that such information will prove to be accurate or that management's expectations or estimates of future developments, circumstances or results will materialize. As a result of these risks and uncertainties, the results or events predicted in these forward-looking statements may differ materially from actual results or events.